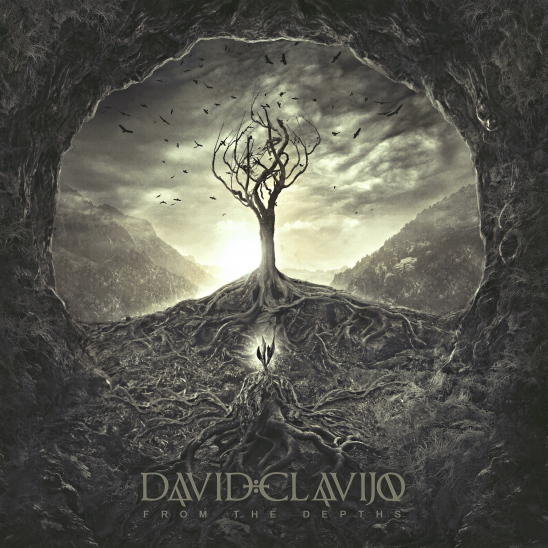 From the Depths is the follow-up recording to The Landing by composer and multi-instrumentalist David Clavijo, who was born in Andalusia, Spain. Inspired by a trip to the nearby Balaeric island of Ibiza, which is renowned for its distinctive brand of chillout and electronic music, David’s influences also include artists such as Mike Oldfield, Enigma, Vangelis, Brian Eno and Jean Michel Jarre. The album begins with the title piece, “From the depths”, which is led by melodic piano and flute amidst tribal and electronic percussion. The composition is soon joined by soaring electric guitar, followed by a serene pause with indiscernible spoken word towards the middle of the piece, before picking up pace again. The world-chill vibe of this track is carried into “When We Were Together”, a piece characterized by piano and Spanish guitar that possesses a sunny, breezy Mediterranean flair. “Fly with Me” follows in the same vein with a diverse array of alternating piano, flute, strings and electric guitar amidst gentle percussion and tinkling bells. Native flutes and chants adorn “The Song of Wisdom”, whereas “Fragile World” is a more Celtic-laced offering featuring the vocals of Laura Powers. Gregorian chants lend a sacred mystique to “Sanctus Dominus”, an Enigma-inspired track complete with shakuhachi flute and electric guitar. A Balearic feel permeates “Sitting on the Seawall”, which is easily my favorite track on the album. This definitively sensual number offers touches of smooth jazz with saxophone courtesy of Premik Russell Tubbs, and the additional delights of both classical and electric guitar. The ethereal vocals of Charlee Brooks grace “The Journey”, a whimsical piece that conveys a feeling of flight and fantasy, as she sings a lyrically indecipherable yet phonetically lovely tune. Chad Lawson lends his piano to “Où est mon Bonheur?”, a more contemplative piece with a classical touch that additionally features cello. The voice of Charlee Brooks returns for “Out of the Depths”, an alternate version of the opening track with English-sung lyrics. Closing out the album is “Fragile World (Bonus Track)”, once again showcasing Chad Lawson on piano, as he’s joined by singer Rosa Rosa Cedrón. This time we are presented with an entire reworking of the original piece, absent of rhythm and with lyrics sung in Spanish. This review was originally published on Journeyscapes Radio on 06/17/16. 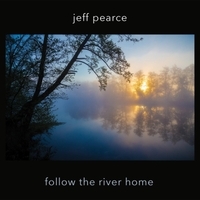 Follow the River Home is the highly anticipated follow-up to the award-winning album With Evening Above by Indiana-based ambient guitarist, Jeff Pearce. Mastered by Tom Eaton for Imaginary Road studios, the album is comprised entirely of electric guitars that often resemble a surround-sound of both guitars and synthesizers resonating throughout a cathedral. “Under Summer Stars” opens the album with an enveloping soundscape of gently melodic guitar amidst layers of tenebrous chords. Conveying a pensive mood with a touch of melancholy, this atmosphere is conveyed throughout most of the album. Carrying us into the next piece, “Downstream I” is a classic ambient-space composition, characterized by low drones, high timbres and mid-range tones, as the collective guitar washes mimic a choir of voices. “Outpost” soon emerges from the shadows, where misty chords morph and swell around a looped guitar melody at its center point. “Snowfall” follows afterwards, a composition I was especially delighted to see included on here. A live recording of this song originally aired on the syndicated radio program Echoes, and while I’ve long known that Jeff could seriously rock, this is the first time he’s included a noticeably rock-influenced composition on one of his albums. The piece begins with cascading guitar loops that are soon followed by a soaring, sensual electric guitar riff, creating an exquisite fusion of ambient-space and classic rock music. On “Downstream II” Jeff once again delivers a composition that deviates somewhat from anything he’s recorded in the past. Ethereal guitar chords open this piece, followed by spinning layers of guitar loops that eventually dissipate into a pool of billowing atmospheric tones, reminding me somewhat of both Steve Reich and Tangerine Dream. The album’s lengthiest track, “Gathering Stars”, is quite possibly one of the most beautiful pieces of ambient-space music I’ve heard in years! Bathed in obscurity, this metamorphic composition emerges with spacious chords that gently rise and fall, and expand and contract, until scattering like particles of light upon the darkness. Closing out the album is the title track, “Follow the River Home”, a comfortingly warm piece that feels intimately connected to hearth and home. Led by a gentle, down-to-earth guitar melody with spacey timbres hovering in the background, it serves as a tender reminder that ultimately, home is indeed where the heart is. For more information please visit the artist's website. This album is also available at Bandcamp, CD Baby, Amazon and iTunes. Review originally published on Journeyscapes Radio on 06/03/16. 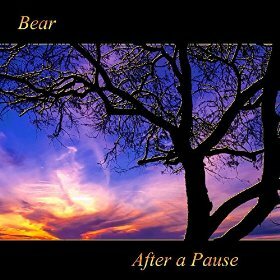 After a Pause is the second solo release from Bear, a talented keyboardist and electronic percussionist, as well as the brother of guitar virtuoso Bob Kilgore. Comprised of fifteen instrumental tracks of varying styles, After a Pause offers nearly an hour of contemplative enjoyment and spirited fun. “Once Darkness, Now Light” opens with a low drone and spacey synths that are joined by subtle chimes, immediately creating a wonderful sense of anticipation. 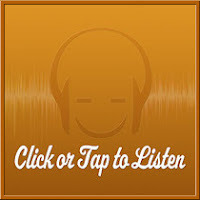 Switching gears into solo piano is “For a Short While”, before reverting back to an electronic theme with “Colors of Sunrise”. Characterized by melodic sequencers and glistening vibraphone which are underscored by fretless bass, the piece seems to mimic the sun’s rays reflecting and shimmering upon the water. Acoustic guitar opens “Everyday Life” which is soon joined by slick bass and drums. This groovy tune is another standout that boasts a tinge of funk with a sprinkling of piano throughout. “Dancing for Eternity” is quite possibly the album’s most fun offering, as digital bleeps and a disco beat exude colorful buoyancy. Another noteworthy track is “Pressing On”, where cinematic strings and harpsichord-like synth convey a feeling of flight and fantasy. I’m also especially fond of “The Race”, another electronic piece characterized by vintage synthesizer motifs and a retro-futuristic vibe that alludes to a mission in space. “To the Remote Regions” is another particular highlight defined by watery sounds swirling about, complemented further by drums and tribal percussion. Closing out the album is “Princess Alaina”, an uplifting piano piece accompanied by gentle strings, making for an appropriately tender yet optimistic conclusion. This album can be purchased on Amazon and iTunes. This review was originally published on Journeyscapes Radio on 06/01/18.